Union Station on Wednesday night, partially painted. All images by the author. 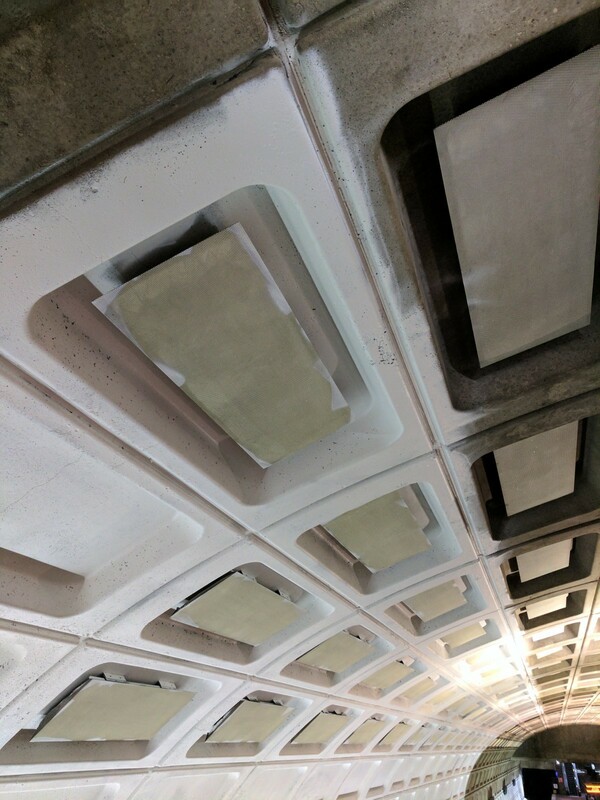 Without warning this week, Metro started painting the vault (the walls and ceiling) of the Union Station stop. The stark white paint stands out and flies in the face of what Metro's original architects envisioned. Unfortunately, this work is irrevocable. 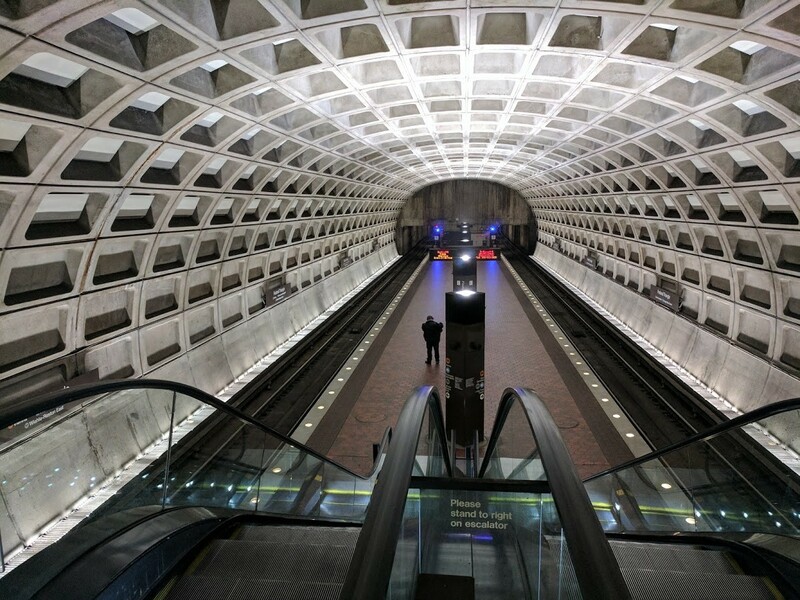 The architectural style of virtually every pre-2004 Metro station is called Brutalism. 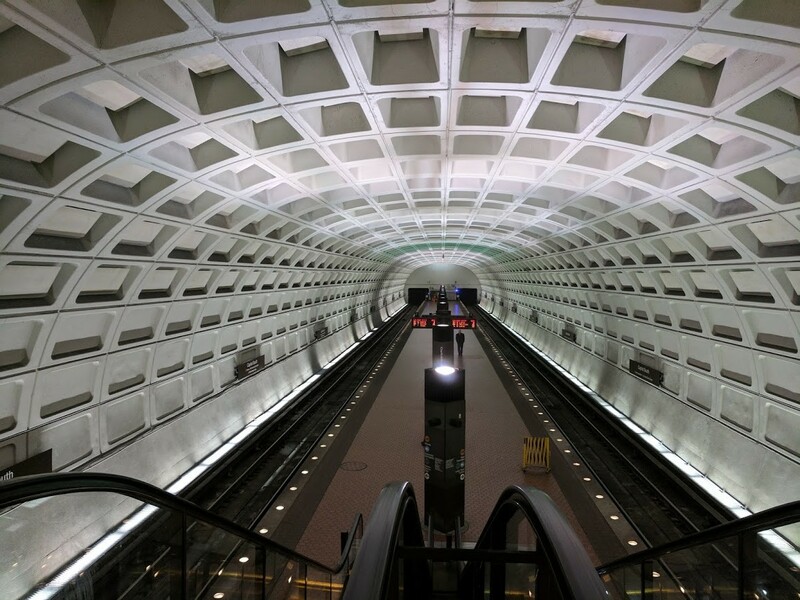 The style's name doesn't come from the word “brutality”, but rather from the French béton brut, which means “raw concrete.” While Brutalism and its exposed concrete haven't always been looked upon fondly, the Metro is generally regarded as a fairly well-designed example of the style. But if there's one cardinal rule of Brutalism, it's that the concrete should never be painted or otherwise altered. Doing so is antithetical to the tenets of the design. 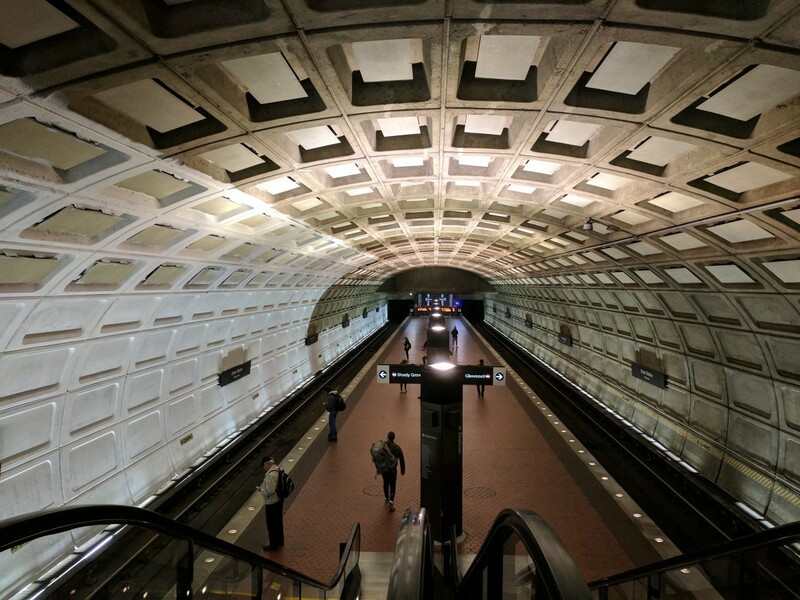 According to spokesman Dan Stessel, Metro is painting the vault at Union station to improve lighting conditions. Unfortunately, while this project will likely result in some immediate improvement, the effect will fade over time unless Metro takes steps to maintain the paint through regular cleaning and periodic repainting. Experience suggests that Metro is unlikely to make those efforts, meaning that the lighting conditions will deteriorate. Since the 1992 painting of Farragut North, Metro has painted other stations. Notably, the stations on the Blue/Orange/Silver Line from Federal Center SW to Stadium Armory. Presumably these stations were painted for similar reasons as Farragut North, to treat discoloration of the concrete from seepage. But for over a decade, the agency hasn't painted the vaults at any new stations. Until now. The difference is striking from an architectural standpoint. The concrete is less textured. The contrast between the interior and exterior of the coffers is muted. Compare the unpainted vault at Federal Triangle, above, to the painted vault at Capitol South, below. Both of these pictures were taken with the same camera only a few minutes apart. I haven't done anything to edit the lighting or contrast in either photo. The painted vault at Capitol South. Despite the coat of paint at Capitol South, the lighting conditions don't appear any better. It turns out that lighting matters much more than the color of the walls. Clean fixtures and brighter bulbs would go a long way. So would replacing bulbs when they burn out. Metro could easily improve lighting in stations like Union Station by replacing florescent bulbs with LED lighting or add new fixtures in certain areas, as has been done at some stops. As it happens, my apartment is painted gray. When a light burns out, I change it. If it's too dim, I turn on another lamp. I would never paint the walls white to make it easier to read in the evening. Painting the vault is irrevocable. Once the concrete has been painted, it can't be unpainted. The genie won't go back in the bottle. The bell can't be unrung. Additionally, the paint will fade unevenly, and will need to be refreshed with new paint periodically, adding maintenance cost. Compare the two sides of Union Station pre- and post-painting. The Shady Grove side has been painted. The Glenmont side remains raw. Metro spent $15,000 in 1992 on the materials to paint Farragut North (about $26,000 in today's dollars). According to the Washington Post's Faiz Siddiqui, Metro spent $30,000 on materials this time around. The total cost to paint Union Station will be between $75,000 and $100,000, which is a lot of money for an agency in dire financial straits. It's not clear if Metro undertook any tests to compare lighting conditions at painted and unpainted vaults. If there is a difference at Federal Center SW and Capitol South, it's one that is imperceptible to my eyes from the conditions at Federal Triangle. And that may mean that without analysis, Metro has taken an irreversible step to fundamentally alter the architecture at one of the primary entry points to the system and the city, and at significant cost, for little to no value. Unfortunately, the whitewashed walls will show grime and grit much more clearly than would bare concrete. Just like white cars show road salt and dust in the winter. Over time, this paint job is unlikely to fare well. 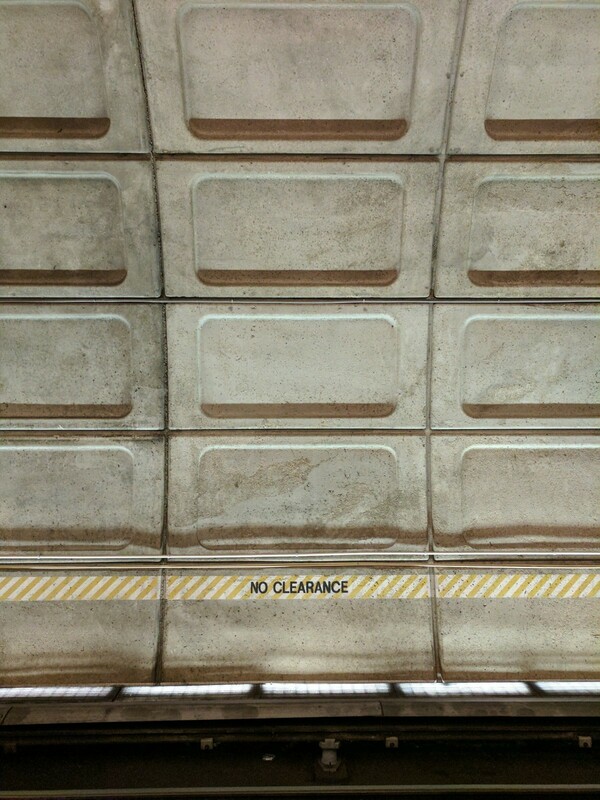 Metro's crews haven't even been particularly careful to avoid painting other features of the station, such as the acoustical tiles and station name signs. Those elements should have been removed prior to the painting, but instead have been allowed to be stained, giving the station a more slapdash appearance. 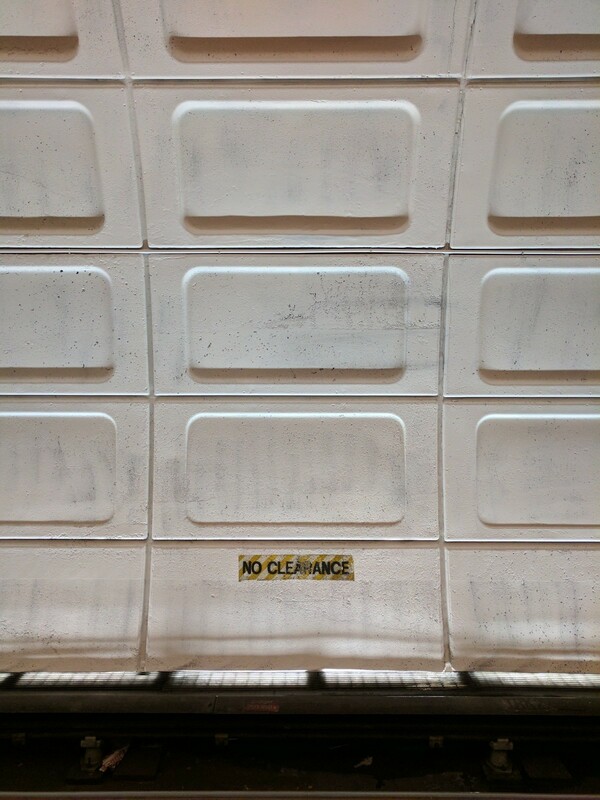 Tiles accidentally stained by paint crews at Union Station. We can hope this is the final Metro station to receive the treatment. But if Metro does decide to paint more stations, we hope they first analyze the proposed solution for effectiveness and also make their plans public before work starts.